Moisturize while you prime with Korres, Nivea and Quo! Korres Greek Yoghurt Smoothie Priming Moisturiser - 30ml - $55 - offers supreme hydration, smoothing and priming before makeup with a weightless lotion rich in probiotics, proteins and minerals to nourish and support skin's natural defense - boosted with 3 types of hyaluronic acid, it promotes skin elasticity and reduces the appearance of pores and fine lines for plumped, healthy-looking skin. 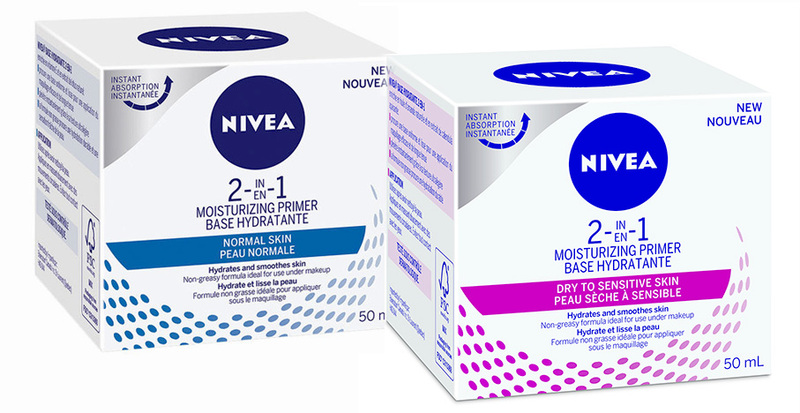 Available now at select Shoppers Drug Mart locations across Canada. Nivea 2-in-1 Moisturizing Primer - 50ml - $10.95 - in normal or dry to sensitive skin options - have a non-greasy formula with an ultra-lightweight texture that instantly absorbs enriched with natural almond oil and soothing calendula extract to provide long lasting moisturization and an even and smooth base for effective makeup application and help it last even longer. Available now at major drug and mass retailers across Canada. Quo Nourish and Prime Hydrating Primer - 28ml - $24 - contains a blend of skin care actives that absorbs instantly to intensely nourish and instantly hydrate skin while preparing it for makeup application to help it go on smoother and last longer. Love your new hydrating primer a lot, limited for space or traveling? Go ahead and use it as or with your night cream too!